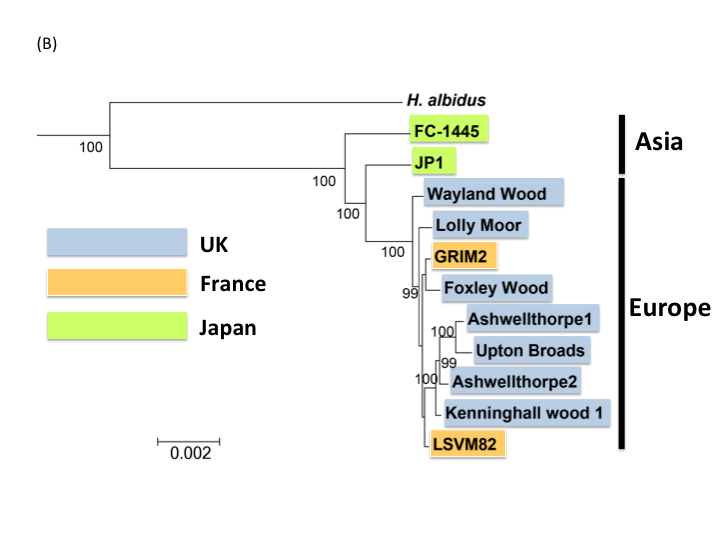 To clarify the origin of Ash-dieback pathogen, we constructed a phylogenetic tree of UK, French, and Japanese isolates. 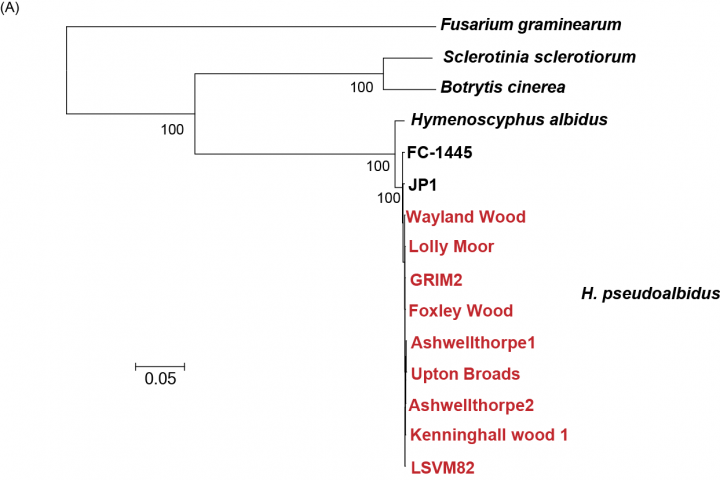 Based on high quality SNPs and alignments of short reads from RNA sequencing of infected Ash tree samples from seven locations across Norfolk and Suffolk of UK and Japanese samples, we reconstructed the consensus sequences of genes for these tested samples. We searched single copy genes in Fusarium graminearum, Sclerotinia sclerotiorum, Botrytis cinera, Hymenoscyphus albidus, and H. pseudoalbidus using OrhoMCL (Li et al. 2003 Genome Res. 13:2178-89.) The 2,964 single copy genes were identified and used for the construction of the tree. We built a maximum likelihood phylogenetic tree based on third codon positions of the genes using RAxML software (Stamatakis et al. 2005 Bioinformatics 21:456-463). Maximum likelihood trees based on 3rd codon positions of 2964 genes. The number on braches shows bootstrap probability. (B) The enlarged tree in Hymenoscyphus species. Tsuyoshi Hosoya from National Museum of Nature and Science, Japan kindly provided Japanese samples. Steve Collin from Norfolk Wildlife Trust kindly collected some of the UK samples.